This first year SFG veggie gardener is being put through the hoops. Started off in March with everything looking beautiful. Over 200 seeds started and seedlings planted. Then came the snails, slugs, earwigs and roly polies. Sluggo Plus took care of that along with cleaning up the whole backyard. Then came the white butterfly with her green cabbage worms. Ended up pulling out some of the plants most affected. Then came the tomato syndrome that everyone seems to be writing about. Still struggling with them. Just had a cool spell with some strong winds. Survived that. Now we are expecting 3 days over 100 degrees! What next? I am in awe of those who can garden so successfully as evident by your beautiful photos. Re: Good grief! Here comes the heat! You know gardening can be stressful with mother nature having her say about things. Just keep you chin up and think that as least next year you will know all about how to take care of snails, slugs, earwigs, roly polies, the white butterfly with her green cabbage worms, and how to help tomatoes that are turning yellow. Now you can say that you survived all of this and still managed a decent harvest by the end of the season than you too will be a successful gardener!! I saw your thread title and thought surely this post wasn't meant for the PNW region... here comes the heat? Nothing but rain here! So I moved this to the Northern California region. Sounds like you're learning quickly how gardening can become a fight for survival! If you plant it, they will come - that's what I learned my first year. Easy to see how so many of the non-organic approaches that we all fight against today were embraced so readily in the past. If it's this frustrating for our hobby gardens, can you imagine when it's your livelihood? Hope to hear of a happy and healthy harvest later in the season, in spite of it all. Gwennifer and Mschaef, Thanks for your replies. This was the year of experimenting. I planted one or two of so many different types of veggies, each in different areas of the back yard and 6' side clearance to see what grew best and where. I have already decided to plant all the brassicas in one box so I can tulle against the white butterfly. I'm naming it the Cabbage Patch! It's partial shade. I'm keeping a hand written diary, complete with print-out little photos that I tape in. Should make for some interesting winter reading!! 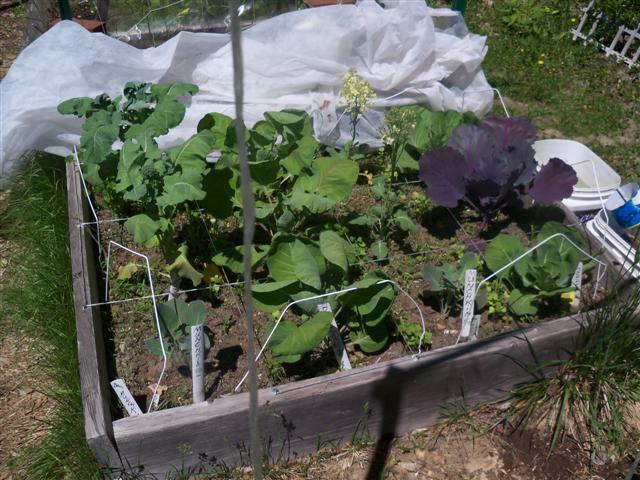 @sanderson wrote: ...I have already decided to plant all the brassicas in one box so I can tulle against the white butterfly. I'm naming it the Cabbage Patch! It's partial shade. I'm keeping a hand written diary, complete with print-out little photos that I tape in. Should make for some interesting winter reading! The cabbage patch - love it! Yep, prevention on those brassicas is much easier than spraying and/or hand-picking once they are already infested. Love that they don't need to be pollinated so the tulle thing works! You sound so organized with your journal and photos. Good for you. Stick with us in the winter and share some photos of your journal please! I'm in your backyard, Sanderson. I live up the mountain in Squaw Valley. We already had 2 weeks of 95-100 degree days this year and more on its way. This year I've added some old window sheers to the tops of my table top gardens for filtered sun and my plants are loving it. I'm still eating lettuce even with the heat. I'm only a 2nd year veggie gardener (with decades of experience flower and landscape gardening). Boy, it sure is different! Hi Audrey, my guess was SQ over Aub. I know you grow your salad in the shade on a TT? I have the salad box picked out for next summer. Let's see. Cabbage Patch and Salad Bowl, so far. The 2 largest boxes are 2 x 4 with elect. conduit and nylon web. Instead of going to Anna's Linens, I bought some tulle at Joann's. Great for the white butterfly-green cabbage worm, but not so great for shade. How are the sheers working? Do they screen enough? My biggest question for you is where I can get shredded wood chips as mulch. i'm going to try Clovis Stone tomorrow. Maybe a feed store for straw. I could sift for wheat or oat seeds. I live in a coastal valley-Carmel valley and it's smoking hot! I was having trouble keeping things moist and am using hay- its not pretty, but it really saves on watering. The hay is way cheaper and doesn't sink into your mix. Incidentally, I also noted that the beds that I had to skimp on with the peat really dry out fast (even though I tried to compensate by adding extra compost) - I'm going to try coir on those beds in the fall and see how it works. I have had to construct a shade for my strawberries to keep them from frying. I used row cover which shades well, but acts like a sail in the wind. I had to cut it every 8 inches along the entire length to keep it from taking off. Sanderson......Even here in the northeast I find that keeping my brassicas in one or two beds so they are easily covered against flea beetles and cabbage moths is the easist method. 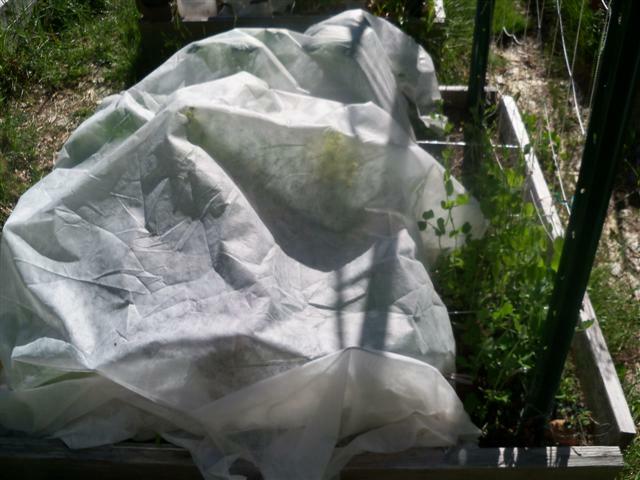 I call this my Brassica Bed and keep them covered with light insect barrier. Sugar Snap peas live in the north squares. Uncovered I found no insect damage to date but my 2 Packman Broccoli bolted from the heatwave we had last week. I pulled them both. The Calabrese Broccoli on the other hand, are forming little heads. Quiltbea, My first year and I am learning a lot from my mistakes. Definitely will group brassicas together so I can cover them with one or two set-ups. Oh look! Apparently, tomorrow will be ten degrees milder than it's been all week. In all seriousness - mulch. Heavily. I think my sunflower plant can take me in a fair fight...it's taller than me, and it keeps giving me dirty looks. The heatwave has passed for now, but I feel that it may just be a warning shot for things to come. I know that this heat is 2 months early and I can't help but wonder if the mulching on my SFG will be good enough to keep my veggies from frying. Well, I'm in coastal GA and it hit around 100 today. (Looking online, it says, temp 99.3, feels like 131, and it ain't kidding!) It's very HUMID here, so even on days when it's 75-80, it feels like 100 degrees. It's been in the upper 80s, low 90s, but it's dreadful. I HATE summers here. (California spoiled me after I lived in LA for 10 years, with the gorgeous weather and no humidity!) We had barely a spring this year. It went from cold, to wicked hot, practically overnight. Rant over. I'm having a truck of wood chips delivered in the next couple of days, so I can mulch the new beds. I'm also going to take the cedar chips out of the tomato bed and put in whatever they deliver to me.